I'm a chef and a writer and love being inspired. What inspires you? Kids love playgrounds. It's a given recipe for a great few hours of fun. Just add kids, a few swings, a slide and some sort of climbing apparatus and viola! Happy kids! My kids are the same as any others, they love to run with wild abandon chasing nothing but fresh air, but when they get to a good playground, the words 'awesome' and 'cool' are exclaimed with great delight. We were driving around last weekend looking at the lovely expanse of water that is Lake Joondalup. It has the natural water-associated peacefulness and birdlife and we were searching for a spot where we could break out our lovely picnic lunch and let the kids run free. Lo and behold, we came upon the Rotary Park, on the east side of the Lake. The kids were in awe of the totally cool equipment and they vanished the moment we stepped out of the car. We grabbed the picnic stuff, set up camp, and then I went for a wonder around the playground area. Honestly, I think this would have to be the best playground/picnic area I've ever been to. They have little huts dotted around the place where people were having BBQs and birthday parties, there are heaps of bench seats to sit on and grassed areas to lay out your picnic blanket in the sun. But the best thing about the place is the equipment. I managed to find my kids racing like mad things all over what looked like a wooden fort. Every second word was 'awesome' and they took great delight in showing me the many slippery dips, secret climbing places, little nooks to hide in, a climbing wall, some (very loud) tubular bells and a spectacular view across the whole place. Also in the playground was a Spiderman-type climbing rope, swings, spinning things, a smaller collection of equipment for those little tackers still getting used to being on their feet and a bunch of other stuff I couldn't see because it was covered in children. Fantastic! The kids ran themselves ragged while we enjoyed the sun, then we walked along the lake itself and marvelled at the huge grassed areas either side of the park, perfect spot for frisbee throwing, bike riding, or just enjoying some green space. We don't live near this park at all, but we'll definitely be making the effort to go there again. There's a coffee van there most days, and there's ample parking and toilets nearby. They've thought of everything. Get over there and enjoy it. 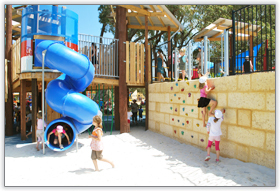 You'll find the Rotary Park along Scenic Drive in Wanneroo.